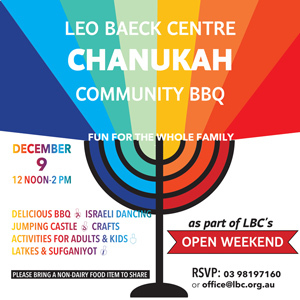 As part of LBC Open Week-end, join our Chanukah Community BBQ with activities for all ages, including supervised Jumping Castle; beginners Israeli dancing; craft activities; games. We provide kosher sausages, doughnuts & soft drinks. Please bring a small non-dairy item to share, plus anything else you wish to drink. Please let our office know whether you are coming, to assist with catering.